I am forever looking for fun and easy ways to get my boys involved around the kitchen. From helping to empty the dishwasher to putting away the groceries, they just love getting stuck in. Long may their enthusiasm for menial tasks last, I’ll admit my own interest is waning. This week, we had lots of fun making pizzas together. Luke is a budding chef and loves anything that involves chopping, sprinkling or rolling. He loves baking, but at this stage we need to start expanding our skill set to savoury (purely because I don’t have time to go buy bigger jeans). Olly loves throwing stuff on the floor so this was also right up his street. 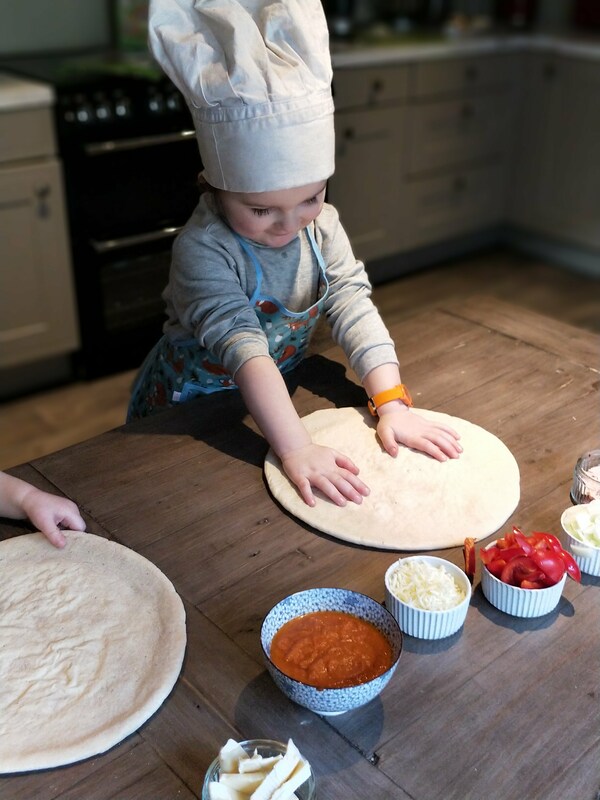 Cooking with your toddler is a great way to spend an hour with lots of fun and learning opportunities for little minds. A cheap and cheerful activity that results in something edible at the end. Need I say more? Clear a space to work on. Remove anything of any importance, because the likelihood is it will be covered in cheese or tomato sauce. Prepare your ingredients and put them in plastic containers or bowls that your kids can lift or drop (without them breaking). Involve little ones in taking ingredients from the cupboard and fridge. The more you can involve them in the activity the more interested they will be! Preheat the oven so it’s good to go once you finish up with assembling the pizza. I actually picked up all of our ingredients in Lidl, including the pizza bases which I found in the fridge section with the fresh pastas. Although I make my own pizza dough from time to time, when doing these types of activities with the kids, convenience is my friend. As the boys get older, making our own dough will be a fun challenge to throw into the mix. Prepare the ingredients and place in little bowls on the table. Allow the kids spread the tomato sauce all over the base of the pizza. Give each base a good covering of Mozzarella over the tomato sauce. Next allow the kids at it: let them make faces, shapes or arrange the remaining topics as they see fit. Resist the urge to ‘fix’ the pizzas no matter how bad they look. Stick them into your preheated oven (approx 180C) for 10-15 minutes. All and all cooking with your toddler can be messy and chaotic, but it’s also great fun. I hope that allowing the boys to get involved in cooking early on will give them an appreciation of food preparation as they get older. This is just a nice way of saying I’ll be getting them to make their own dinners from the age of five! Highlights for Luke included meticulously ensuring even distribution of the red peppers across both pizzas. Olly enjoyed stuffing his face with Mozzarella cheese before enthusiastically throwing it all over the floor. Chef hat completely optional, but it does make him look like a boss.